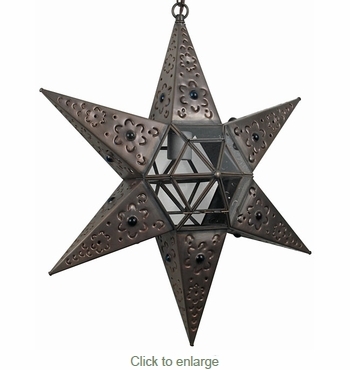 This 6-point rustic tin and glass hanging star light is designed to create elegant lighting for your rustic, southwest, or Spanish colonial decor. This two-sided, six point glass star light looks the same from either side and will enchant all who enter your home. All of our Mexican aged tin star fixtures are authentic creations handmade by artisans in Mexico.